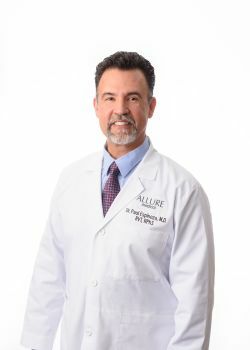 Dr. Paul Espinoza is a native of Charleston, SC and moved to Columbia in 1987 for undergraduate studies at the University of South Carolina. He then attended the USC School of Medicine, graduating with Honors. He is board certified in Family Medicine and a Diplomate of the American Board of Phlebology. Phlebology is the field of medicine that deals exclusively with venous disorders and disease. Dr. Espinoza is one of only a handful of phlebologists in South Carolina with extensive training in ultrasonography that allows him to carry the RVT (Registered Vascular Technology) Certification. He is a member of: Vein Experts, American College of Phlebology, American Medical Association, South Carolina Medical Association, Lexington Medical Association and a fellow of the American Society for Laser Medicine and Surgery.